Anglers worldwide travel to the Henry’s Fork of the Snake River every season to fish its diverse waters. One of the most famous trout streams in the United States, the Henry’s Fork is a tremendous dry fly fishery. Prolific hatches and large wild Rainbows make every outing a genuine fly fishing experience. Some of the finest fly fishing guides in the West are available to help you enjoy your fishing experience and to teach you the skills to master the fly fishing art. Enjoy a guided trip or a day of solitude through the acclaimed Ranch waters at Harriman or down the prominent waters of the Box Canyon, both just minutes away from Ponds Lodge. 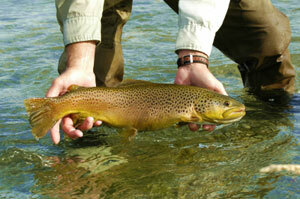 Our area claims the greatest variety of superior fly fishing waters in the country. Rivers such as the Gallatin, Madison, South Fork of the Snake, Yellowstone, Firehole, Slough Creek, Lamar River, and many others are readily available to delight, reward, and even stimulate the most sophisticated of angler. Immaculate trail systems surround our area and are a phenomenal amenity to all lodge guests. Whether it’s a hike in Harriman, Yellowstone or anywhere in-between, guests will readily enjoy anything from a leisurely stroll to an all-day hike, in picturesque forest settings. 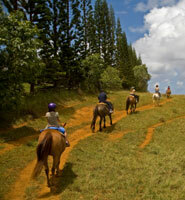 There are three stables within the Island Park area, housing excellent horses and offering rides of all levels. The closest horse concessionaire is 10 minutes away, at Harriman State Park. Extravagant scenery and wildlife are abundant along the Big Springs to Mack’s Inn National Water Trail, or down the Henry’s Fork - through Harriman, or along the Buffalo River - near Ponds Lodge, itself. Rentals are readily available nearby. Island Park is the perfect destination for any ATV/OHV outing. Hundreds of miles of marked and groomed trails, as well as old logging roads are open throughout the Targhee National forest. Numerous rentals are available in the Island Park area. Another excellent summer pass-time, jet skiing on the Island Park Reservoir, with a backdrop of the Targhee National Forest, is another impeccable place to start. Jet ski rentals are also readily available in Island Park. The imperial mountains of eastern Idaho are known world wide for their superlative and diverse range of big game animals. Elk, deer, bear, antelope, moose, and mountain lion hunts, to name a few, are available within our area. Many Boone and Crockett records have been established here. Some of the most experienced outfitters and guides are available to fill the dreams of every sportsman. Bright blue skies, crisp mountain-pine air, and dazzling crystals glint off perfectly powdered snow, and invite our guests to come out and play! The snowmobiling in Island Park is as fantastic as it is famous. Guests have the option of renting snowmobiles, hiring guided snowmobile tours in the Island Park or Greater Yellowstone area, or bringing their own sleds for touring and challenging our winter wonderland. 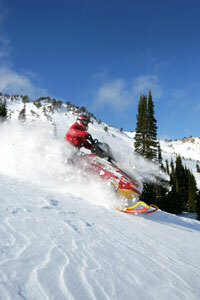 Hundreds of miles of groomed trails await any level of snowmobile aficionado. These snowmobile trails also grant access to mountains rising more than 10,000 feet in elevation, giving the serious high-marker abundant opportunities to show off their riding skills. Impressive hill climbing and ample powder bowls are an exhilarating luxury here, in Island Park. Winter-fun begins in Island Park, and there are plenty of groomed Nordic ski trails in the area. Hundreds of miles of skate skiing, traditional skiing, and snowshoeing opportunities await our guests, throughout the winter season. Harriman State Park is home to over 20 miles of groomed ski trails, no more than 10 minutes away from Ponds Lodge. Set in an aesthetic winter enchantment, Harriman is a celebrated, magical destination for everyone to enjoy, in every season. Downhill skiers and snowboarders, bring your wits and be prepared to revel in the extraordinary groomed runs, open powder bowls, and pristine glade skiing our area has to offer. Nearby ski resorts, Kelly Canyon and Grand Targhee are both ready and waiting hosts to all downhill thrill-seekers. Home to Rainbow, Cutthroat, and Brook Trout, Henry’s Lake and Island Park Reservoir accord sensational ice fishing throughout the winter months. Ice anglers, bring your augers and your good fortune, and we will fill you mugs with hot coffee to keep you warm while you trawl for fish, above the icy waters!